In the early 1800’s, people carved G.T.T. on the door of their home so friends would know they had “Gone to Texas” in search of a better life. In 1821 Stephen Austin, who had been left an empresario grant by his father, Moses Austin, led 300 families to the rich land along the Brazos River establishing the first successful colonization by Americans in present-day Texas. Among the settlers was the Robinson family who built a ferry at the confluence of the Navasota and Brazos rivers where the town of Washington-on-the-Brazos grew up and became The Birthplace of Texas. Today little remains of the town but a replica of Independence Hall marks the place where settlers met to make a formal declaration of independence from Mexico thus creating the Republic of Texas. Sitting in the hall I tried to imagine the pressure felt by the 55 delegates to the Convention of 1836 as Santa Anna and his force of 1500 marched on the Alamo in present-day San Antonio. The urgency was confirmed in a letter from William B. Travis, the commander at the Alamo. He wrote, “I am besieged, by a thousand or more of the Mexicans under Santa Anna.” He ended with “I am determined to… die like a soldier who never forgets what is due to his own honor and that of his country – Victory or Death.” As Janice, the guide, explained, “It was a bitter sweet moment in Texas history. Those who signed the document didn’t know what had occurred at the Alamo and those at the Alamo did not know that independence had been declared.” The loss at the Alamo became the driving spirit of Texas independence. 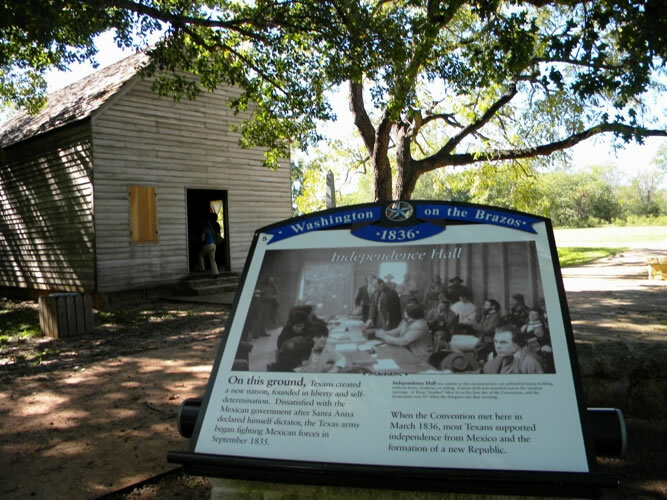 As I wandered around the site, now a Texas State Historic Site, on a beautiful November day I tried to envision Washington-on-the-Brazos as it was on March 16, 1836, the day after their constitution was adopted when the citizens had to leave their homes to escape the advancing Mexican Army. The convention members signing the Declaration were as good as signing their death warrants if the Revolution failed. They returned a month later when the Mexican Army was defeated at San Jacinto. The town of Washington died when it was bypassed by the railroad, but the independent spirit of Texans survived. After watching the informative video highlighting the formation of the sovereign nation of Texas at the nearby Star of the Republic Museum, I followed the displays depicting the history of the Republic from the Native Americans to the European explorers to the settlers to those who fought for independence. 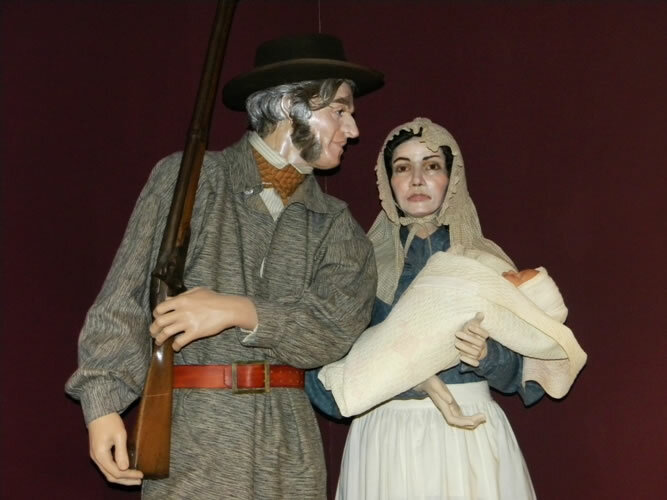 The multicultural Faces of Texas exhibit relates various perspectives of the settlers told in their own words. 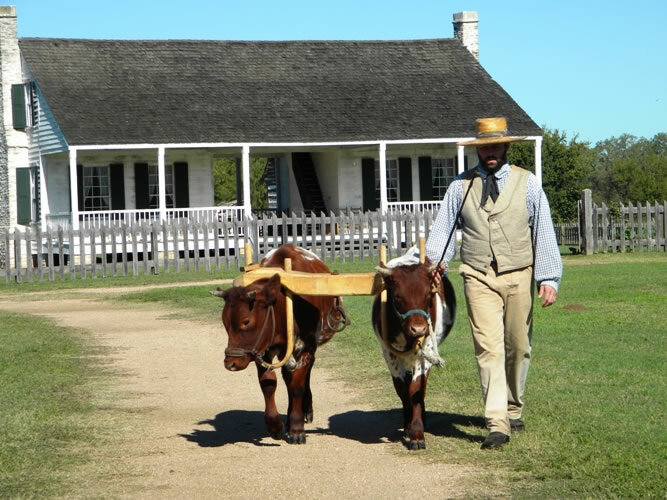 While the hard life of the settlers has been relegated to the past it is still possible to have a “real” Texas experience at Texas Ranch Life, an 1800-acre working guest ranch. 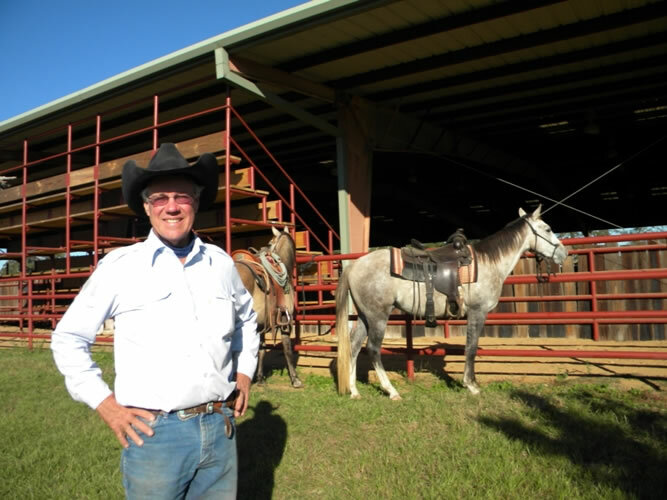 John Elick, the owner, demonstrated the art of cutting with his horse, Rebel. 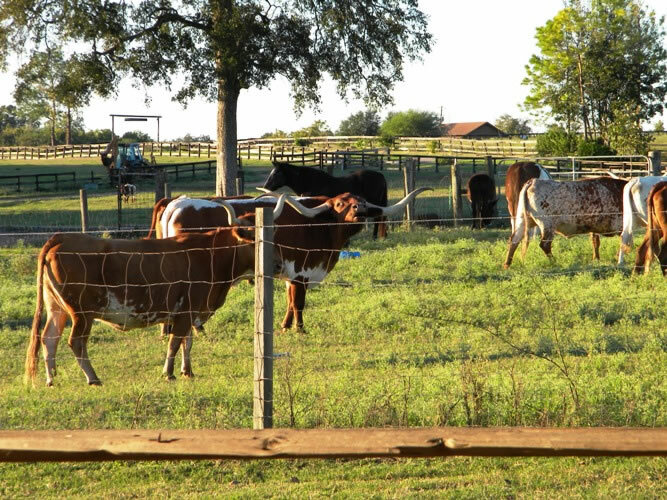 Rebel and John worked as one cutting one of the longhorns from the herd. The next day after an introductory lesson explaining everything from how to mount and control the horse we were off for a ride through the fields. You might say I started as a tenderfoot but ended up a buckaroo. John and Taunia Elick offer their guests exquisite period-style accommodation along with riding, roping, hunting, fishing, plus participation in cattle drives and roundups. 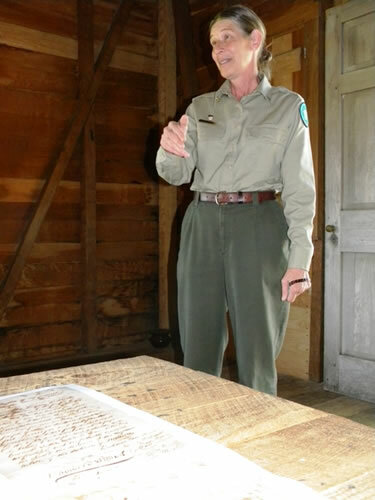 Brenham, now the hub of Washington County, is located midway between Houston and Austin and offers opportunities to learn about the history, experience the culture, and enjoy the natural beauty of the area. 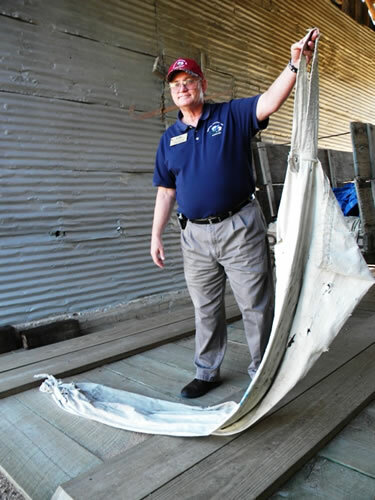 At the Cotton Gin Museum in nearby Burton, Jerry Moore explained that, “If you were old enough to walk you were old enough to pick cotton.” And, that the word “sucker” comes from the lowest paying job at the gin, the person who sucked up the cotton. Everyone in Texas knows that “I am going for Blue Bell” means it is ice cream time. 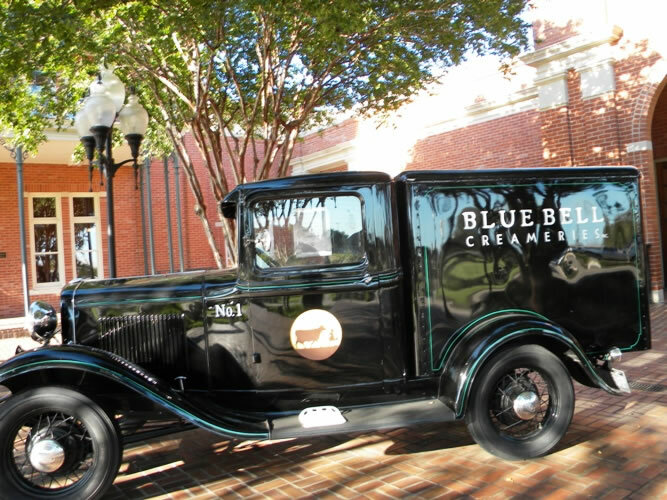 Blue Bell Creameries, based in Brenham, has been cranking out ice cream since 1907 and is still family owned. The short video and tour of the production facility ended with ice cream - my choice, the number one favorite, Homemade Vanilla. I loved wandering the streets of Brenham – looking at antiques and learning how to eat like a Texan. I enjoyed an apple kalachy with locally produced Independence Coffee at the Old Town Bakery and Sawdust Pie at It Must Be Heaven Cafe. 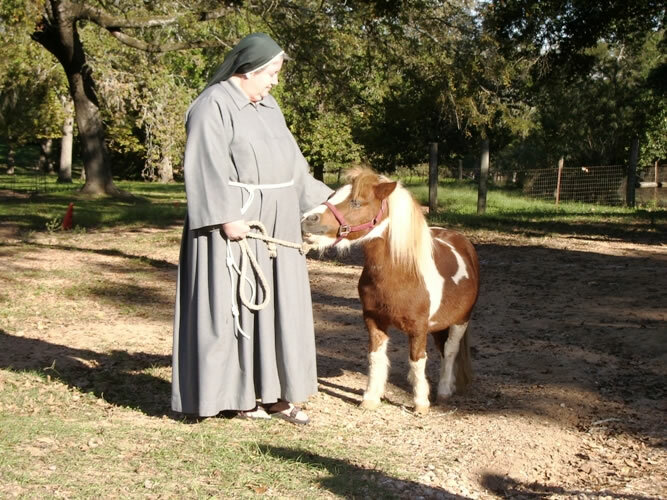 I bought lavender cookies at Chappel Hill Lavender Farm and petted miniature horses at the Monastery of St. Clare. I was spoiled for choice of things to see and do. There are a variety of accommodations but staying in a cottage on a ranch provides the best experience. I never wanted to leave my Lake View Cottage at Hackberry Hill. The three-bedroom cottage surrounded by the ranch had a back porch that looked out over a pond and a field of longhorns. From the swing on the front porch I chatted with the beautiful black horse that moseyed by the gated yard. I plan to go home and carve GTT on my front door.